Already by now I’ve learnt quite a bit mainly trial and error and by reading on the net in various forums. But I was persevering with viewing and capturing Jupiter. 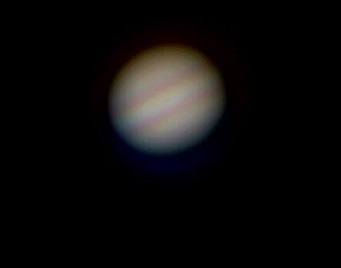 Quite a few nights in early February were clear so I’d often pop out with the scope and view the wonder that’s Jupiter. The next day I found a SkyWatcher ‘Auto Focuser’ (should be called a motor focuser there’s no auto about it) that wasn’t supposed to fit a 130M but I’d found a couple of people that had managed to make it fit, so I ordered one, I wasn't going to give up that easily! When the focuser arrived, I set to making it fit this in itself is not that difficult as you can drill some new holes in one of the brackets that come with the focuser. 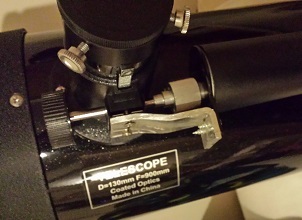 However I didn’t want to damage something that I may need at a later date if I decided to upgrade my scope (wink wink). So I popped out in to the garage and had a rummage about for something that would do the job, after a little searching I found a piece of angled aluminium – this was to be the basis of the bracket. I cut it to shape gave it a little angle and drilled a few holes and voilà a bracket was born. I removed the two screws that hold the focus wheels in place and by unscrewing it I removed one of the wheels. I put the focuser back together but added the bracket over the top and used slightly longer screws to hold it in place, attached the motor and attached it to the focusing bar. So now I can focus my scope without making myself feel too sick! Around the middle of the month I read an article in Astronomy Now (I think) about the ISS and again I was amazed that it can be seen streaking across the sky from time to time. I registered my email with NASA Spot the Station at http://spotthestation.nasa.gov/ and was soon receiving emails alerting me when it will be coming over head. Around the 17th of February I had an email stating that the ISS will be visible from my location at approx. 17:00 for 3 mins. When the time come I popped out side and right on time there it was streaking across the sky, how amazing is it to see a manmade object in space gliding across the sky with real live humans from planet earth inside possibly looking down at us. The next night the ISS was coming over again and this time it was going to be at about 90º so I thought I’d try and capture it with the telescope. Sadly I didn’t manage to capture anything but we did manage to see it and you could clearly see the square-ness of it but it was moving too fast to capture. I knew that Jupiter would not be about for ever and as it had an 11 earth year orbit of the sun it would be 2025 before it will be this high in the sky again. so I decided to turn my attentions back to Jupiter. 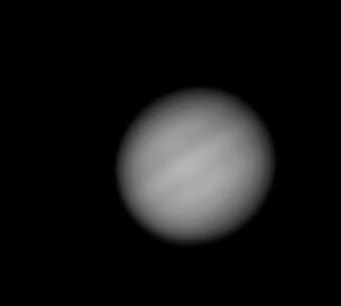 Towards the end of the month I managed to get in quite a few observing sessions (none of which made me sick I’d like to add) and managed to get some good footage of Jupiter for processing in Registax6 (well I thought they were good). Due to the resolution of the camera I could only capture at maximum 35 seconds at a time for processing. 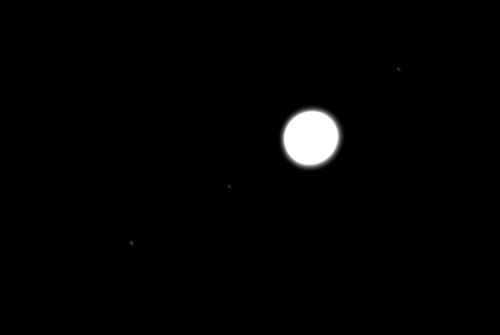 As you can see they are clearly Jupiter (you should just be able to make out three of it's moons) but after a few comments by Astronomy friends saying they’ll be really good after processing. I thought it’s time to start looking for a new WebCam. There is no way I could stretch to the legend that is the Philips SPC900NC or an Astronomical imager so I had to set my sights smaller. My friend John had been having a play with an old Xbox WebCam he got off eBay for £3 and had produced some great results that blow my images out the water so I think this is the way to go!